There are few good movies which focus on the simple things of life, which have the ability to make us feel good and happy when the end title pops up. These movies actually tell us few things that we forget to enjoy. OK Kanmani / Oh Kadhal Kanmani (Tamil), directed by Maniratnam, ‘the man who made Nayagan’ (in Bharadwaj Rangan’s words) – Even if you’re one of those movie fans who don’t enjoy musical-romantic films, you need to watch this movie. It is like celebrating ‘romance’. This charming Tamil film about love of two generations will cool you up better than the Cake Deserts of Amadora Gourmet. This Maniratnam movie will make you wanting to be loved. Don’t be surprised if you find yourself falling in love. Every moment in the movie is an outpouring of love. From happy to sad to angry to loving – it covers so much emotional ground; it is the core strength of the film. Love – The best emotion that can be conveyed through art. 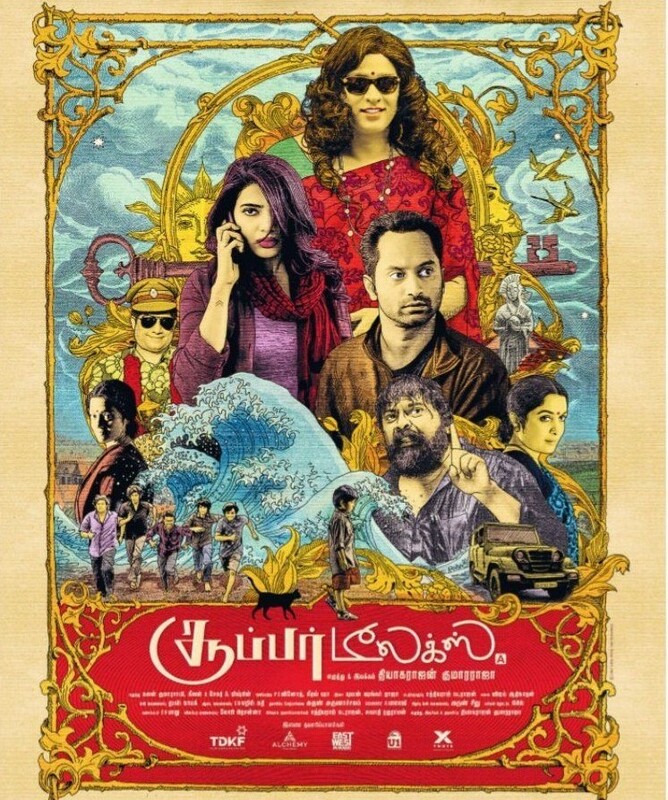 Just after Thaara and Aadhi’s first fight, post-interval, they find Bhavani Aunty sitting on roadside while raining – ‘Malargale Ketten’ song starts at this point – follows the hospital scene (starts with Ganapathy (Prakshraj)’s face trying to hide all his pain inside) – ‘Pallam Veezhndhen Sigaram Serthanai, Vellam Veezhndhen Karaiyil Serthanai, Edhanil Veezhndhaal Unnaidam Serpaai’ – which continues to their apartment – then comes the best of all dialogues: ‘Oru Naal Ungalai Maranthidiuvena Ganapathy?’ (Roughly: ‘Will I forget you also?’ or painstakingly ‘You’ll be gone from my mind.’) – here, we feel a drop of tear. For the most part of the movie, it realistically shows the relationships’ happy and sad sides, successful and unsuccessful part, love with a future and without a future. Every Maniratnam movie is a magic show, and this one is a special show for the young generation, a movie that touches everyone who watches it. The AR Rahman’s music tracks will leave you electrified. Maniratnam movies are filled with those dialogues that you feel to hug. This one ends up lovelier than you ever expected it to be. You’d have to be a Frankenstein not to love this movie. It is a very heart-warming, romantic film with star-studded performances. Performance vice the best scene of the movie (apart from the above mentioned Prakashraj shot) must be mentioned here as it is one of the most pleasing moments I have seen in a Tamil movie. The sudden brightness that comes on Thaara (Nithya Menon)’s face when Aadhi uses the word ‘Kanmani’ for the first time, is classic. The happiness is showed through a kiss which follows. It is shown just before the song as Faizy thinking of his moments with Shahana, when Uppuppa is talking about love. The very next scene ends with the starting of the song ‘Ye Sainamika’ which shows Aadhi’s feeling towards Thaara and the song goes like this ‘Imaigalin Thaazhvil Udaigalin Thalarvil, Ennodu Pesa Mattum Kuyilaagum Un Kuralil, Varanda Udhattin Vari Pallangalil, Kaadhal Dhaanadi En Meedhu Unakku’. These two movies might not be the greatest, but definitely these two will leave you with a glowing feeling. The real success of Anwer Rasheed and Maniratnam in these films is how it effortlessly manages to leave a profound emotional impact upon the viewer. Coming to the cute love story of Uppuppa (Thilakan) and the heart-wrenching deep love of Ganapathy Uncle (Prakashraj), Uppuppa is close to eighty and is living in the memories of his wife, while Ganapathy is a loving and very caring husband of same age. If it is ‘Vathilil Aa Vaathilil’ for Uppuppa, it is ‘Malargale Ketten…’ for Ganapathy. Usthad Hotel (Malayalam) – If Malayalam industry was celebrated for its experimental and bold subjects during the golden period of 1960-1990, post 2010 the industries is more popular for its realistic and feel-good movies. Anwer Rasheed’s Usthad Hotel is one of the best in the business. Usthad Hotel that makes you think about life in general and how each person can make a difference in this world and make the life great. During the second half of the movie, through the scenes in Madhurai, the movie makes us realize that we have missed the chance to help others. It’s a simple, but profound lesson. ‘What is the purpose of my life?’ The best question that can be asked through art. Sure, there’s a lesson to be learned about caring others and enjoying small small things happenings around us instead of the mechanical life most of us are leading. Ushtad Hotel and Uppuppa shows the importance of exercising selflessness. … and there are two love stories too. Who can forget that beautiful portion of the movie when Uppooppa (Played by Thilakan, whose superlative acting abilities takes us close to the character) tells his love story to Faizy, which leads to the song ‘Vaathilil Aa Vaathalil…’ – Uppooppa stops the story nowhere after introducing his love story to Faizy – Song continues ‘Kaanaan oro vazhi thedi kaanum neram mizhi moodi omale ninneelayo naanamaayi vazhutheelayo, Punnaram, Choriyumalavilaval ilakimariyumoru kadalayi, Kinnaram, Parayumazhakil aval ila ki adarumoru mazhayaayi, Kalichiri niravukal kanimalarithalukal vidaruvatharumayilaayi’ – Inbetween there is a shot of Faizy (Duluer) facing Uppuppa (Thilakan) with a slight smile with something in his mind, like ‘Thinking of Uppuppa, the old man who have only memories, with him, now’ – that moment, we see the great actor in Dulquer Salman (This is his second movie). Anyway, the song ends not before creating a smile on your face and happiness in your heart.This is one of the rare moments when a song isn’t just a song, but a stand-alone movie itself. That is the beauty of this film. If you are sad and looking for a movie to get yourself lost in, then simply watch this. This will end up as a movie which you will want to force everyone you know to watch. This film’s strength is its ability to lift our feel no matter how many times we’ve watched this. Every five minutes of this movie gives something for viewers to enjoy. Usthad Hotel and OK Kanmani, watch these back to back – both the movies have same lead actors, very beautiful music tracks, and ‘love’ – and is waiting to tell you something. It’s all about looking back at our life and realizing you weren’t cool before but if you can now, you will look awesome. Feel it for yourself.